m6A standard control was added into the assay wells at different concentrations and then measured with the EpiQuik™ m6A RNA Methylation Quantification Kit (Colorimetric). Schematic procedure of the EpiQuik™ m6A RNA Methylation Quantification Kit (Colorimetric). Colorimetric ELISA-like assay using an m6A antibody with easy-to-follow steps for convenience and speed. The entire procedure can be completed within 3 hours and 45 minutes. High sensitivity, of which the detection limit can be as low as 10 pg of m6A. Unique binding solution allows RNA >70 nts to be tightly bound to the wells, which enables quantification of m6A from both mRNA and ncRNA such as tRNA, rRNA, and snRNA. Optimized antibody and enhancer solutions allow high specificity to m6A, with no cross-reactivity to unmethylated adenosine within the indicated concentration range of the sample RNA. N6-methyladenosine (m6A) is the most common and abundant modification in RNA molecules present in eukaryotes. The m6A modification is catalyzed by a methyltransferase complex METTL3 and removed by the recently discovered m6A RNA demethylases FTO and ALKBH5, which catalyze m6A demethylation in an α-ketoglutarate (α-KG)- and Fe2+-dependent manner. It was shown that METTL3, FTO, and ALKBH5 play important roles in many biological processes, ranging from development and metabolism to fertility. m6A accounts for more than 80% of all RNA base methylations and exists in various species. m6A is mainly distributed in mRNA and also occurs in non-coding RNA such as tRNA, rRNA, and snRNA. The relative abundance of m6A in mRNA transcripts has been shown to affect RNA metabolism processes such as splicing, nuclear export, translation ability and stability, and RNA transcription. Abnormal m6A methylation levels induced by defects in m6A RNA methylase and demethylase could lead to dysfunction of RNA and diseases. For example, abnormally low levels of m6A in target mRNAs due to increased FTO activity in patients with FTO mutations, through an as-yet undefined pathway, contributes to the onset of obesity and related diseases. The dynamic and reversible chemical m6A modification in RNA may also serve as a novel epigenetic marker of profound biological significance. Therefore, more useful information for a better understanding of m6A RNA methylation levels and distribution on RNA transcripts could benefit diagnostics and therapeutics of disease. In this assay, total RNA is bound to strip wells using a RNA high binding solution. N6-methyladenosine (m6A) is detected using a specific capture N6-methyladenosine antibody and detection antibody. The detected signal is enhanced and then quantified colorimetrically by reading the absorbance in a microplate spectrophotometer at a wavelength of 450 nm. The amount of m6A is proportional to the OD intensity measured. Both negative and positive RNA controls are provided in this kit. A standard curve can be performed (range: 0.02 to 1 ng of m6A) or a single quantity of m6A can be used as a positive control. Because m6A content can vary from tissue to tissue, and from normal and diseased states, or vary under treated and untreated conditions, it is advised to run replicate samples to ensure that the signal generated is validated. This kit will allow the user to quantify an absolute amount of m6A and determine the relative m6A RNA methylation states of two different RNA samples. The input material required is RNA, which can be isolated from various tissue or cell samples such as cells from flask or microplate cultured cells, fresh and frozen tissues, paraffin-embedded tissues, blood, body fluid samples, etc. The amount of RNA for each assay can be 100 ng to 300 ng. For optimal quantification, the input RNA amount should be 200 ng, as the abundance of m6A is generally less than 0.1% of total RNA. Fukumoto T et. al. (April 2019). N6-methylation of adenosine (m6A) of FZD10 mRNA contributes to PARP inhibitor resistance. Cancer Res. Wu L et. al. (April 2019). Changes of N6-methyladenosine modulators promote breast cancer progression. BMC Cancer. 19(1):326. Niu Y et. al. (March 2019). RNA N6-methyladenosine demethylase FTO promotes breast tumor progression through inhibiting BNIP3. Mol Cancer. 18(1):46. Nettersheim D et. al. (March 2019). N6-Methyladenosine detected in RNA of testicular germ cell tumors is controlled by METTL3, ALKBH5, YTHDC1/F1/F2, and HNRNPC as writers, erasers, and readers. Andrology. Wang Y et. al. (March 2019). Genome-wide screening of altered m6A-tagged transcript profiles in the hippocampus after traumatic brain injury in mice. Epigenomics. Song H et. al. (March 2019). METTL3 and ALKBH5 oppositely regulate m<sup>6</sup>A modification of TFEB mRNA, which dictates the fate of hypoxia/reoxygenation-treated cardiomyocytes. Autophagy. :1-19. Rong B et. al. (January 2019). Reduced delivery of epididymal adipocyte-derived exosomal resistin is essential for melatonin ameliorating hepatic steatosis in mice. J Pineal Res. :e12561. Chen H et. al. (January 2019). Changes of RNA N<sup>6</sup>-methyladenosine in the hormesis effect induced by arsenite on human keratinocyte cells. Toxicol In Vitro. Panneerdoss S et. al. (October 2018). Cross-talk among writers, readers, and erasers of m<sup>6</sup>A regulates cancer growth and progression. Sci Adv. 4(10):eaar8263. Guo J et. al. (June 2018). Deregulation of UBE2C-mediated autophagy repression aggravates NSCLC progression. Oncogenesis. 7(6):49. Dai T et. al. (May 2018). Analogous modified DNA probe and immune competition method-based electrochemical biosensor for RNA modification. Biosens Bioelectron. 114:72-77. Faulds KJ et. al. (May 2018). Glycogen synthase kinase-3 (Gsk-3) activity regulates mRNA methylation in mouse embryonic stem cells. J Biol Chem. Gu S et. al. (April 2018). N6-methyladenosine mediates the cellular proliferation and apoptosis via microRNAs in arsenite-transformed cells. Toxicol Lett. Feng Z et. al. (March 2018). 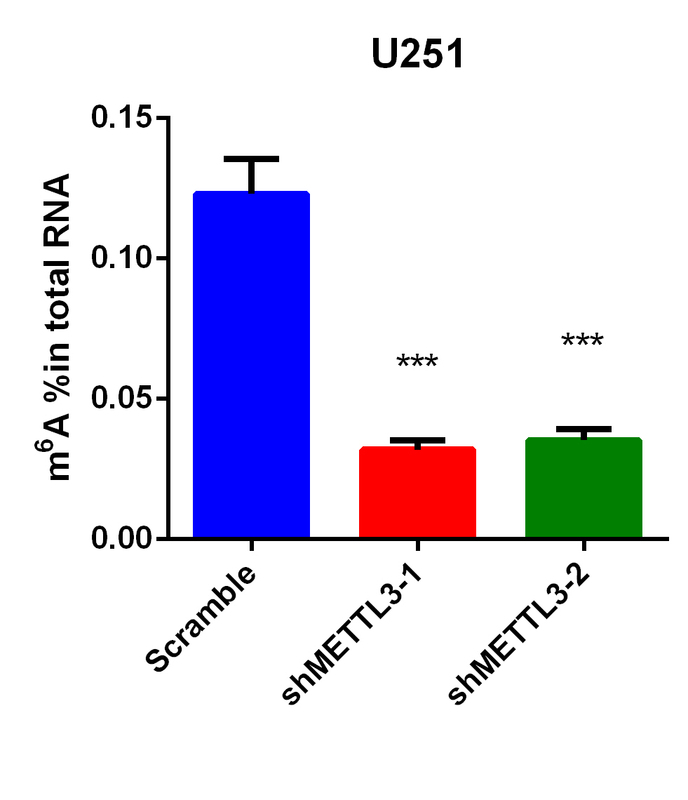 METTL3 regulates alternative splicing of MyD88 upon the lipopolysaccharide-induced inflammatory response in human dental pulp cells. J Cell Mol Med. Ding C et. al. (January 2018). 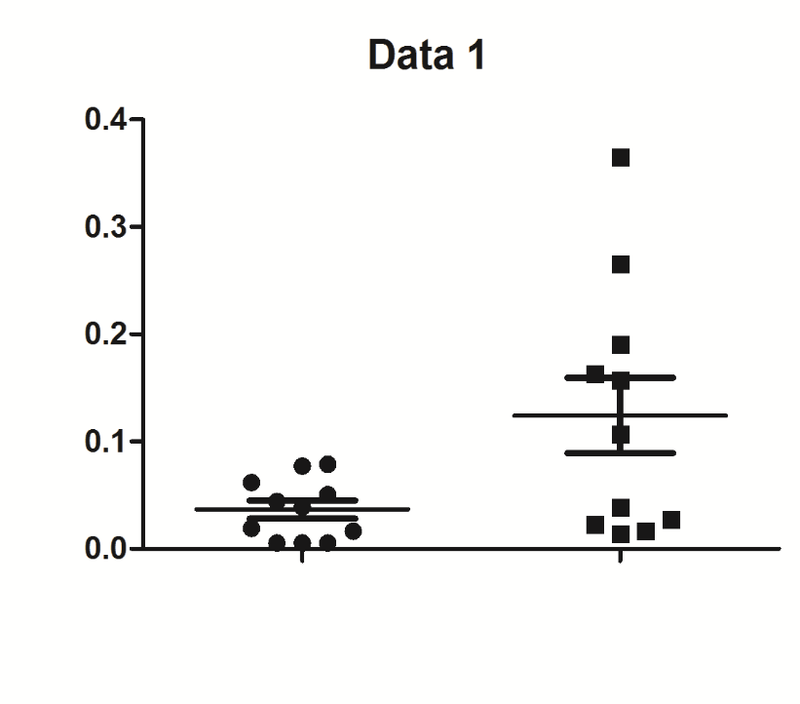 Increased N6-Methyladenosine causes infertility is associated with FTO expression. J Cell Physiol. Zhou S et. al. (January 2018). FTO regulates the chemo-radiotherapy resistance of cervical squamous cell carcinoma (CSCC) by targeting β-catenin through mRNA demethylation. Mol Carcinog. Lu N et. al. (January 2018). Curcumin Attenuates Lipopolysaccharide-Induced Hepatic Lipid Metabolism Disorder by Modification of m<sup>6</sup> A RNA Methylation in Piglets. Lipids. 53(1):53-63. Haiyan Wang et. al. (July 2017). A sensitive photoelectrochemical immunoassay of N6 - methyladenosine based on dual-signal amplification strategy: Ru doped in SiO2 nanosphere and carboxylated g-C3N4 Biosensors and Bioelectronics. Walters BJ et. al. (June 2017). The Role of The RNA Demethylase FTO (Fat Mass and Obesity-Associated) and mRNA Methylation in Hippocampal Memory Formation. Neuropsychopharmacology. 42(7):1502-1510. Elkashef SM et. al. (May 2017). IDH Mutation, Competitive Inhibition of FTO, and RNA Methylation. Cancer Cell. 31(5):619-620. Slobodin B et. al. (April 2017). Transcription Impacts the Efficiency of mRNA Translation via Co-transcriptional N6-adenosine Methylation. Cell. 169(2):326-337.e12. Zhang S et. al. (March 2017). m6A Demethylase ALKBH5 Maintains Tumorigenicity of Glioblastoma Stem-like Cells by Sustaining FOXM1 Expression and Cell Proliferation Program Cancer Cell. Yin H et. al. (October 2016). Electrochemical immunosensor for N6-methyladenosine detection in human cell lines based on biotin-streptavidin system and silver-SiO2 signal amplification. Biosens Bioelectron. Zhang C et. al. (October 2016). Hypoxia-inducible factors regulate pluripotency factor expression by ZNF217- and ALKBH5-mediated modulation of RNA methylation in breast cancer cells. Oncotarget. 7(40):64527-64542. Zhang C et. al. (April 2016). Hypoxia induces the breast cancer stem cell phenotype by HIF-dependent and ALKBH5-mediated m6A-demethylation of NANOG mRNA. Proc Natl Acad Sci U S A. 113(14):E2047-56. Yuen KC et. al. (January 2016). NIPBL Controls RNA Biogenesis to Prevent Activation of the Stress Kinase PKR. Cell Rep. 14(1):93-102.
m6A RNA methylation quantification by ELISA by colorimetric method for cancer cell lines. Isolated mRNA from cell line using standard qiagen RNAprep kit. And then basically followed the protocol by Epigentek which was pretty straight forward. Included were both the positive and negative controls along with the plate. I am attaching here the standard curve by using the supplied positive control. Only need a plate reader. Overall pretty satisfied with the product and would recommend it. Reagents are in excess so it is okay even if there are a few spills. Standard curve using the supplied positive control. This is our go-to kit. The instructions are easy to follow, the results are reproducible, and it is a quality product of good value. We will definitely buy it again. once the reagent is open ,it will expire in a several mouth,and you can’t realized it .you need pay attention! Works as its supposed to. I tried it and its good. I will rebuy it. We used it to measure methylation level of mRNA. The user guide is user friendly, rated 5. The product presented great, rate 5. The overall rate of the product is 5. The delivery was quick and the rep was very friendly and responded quickly when we had questions about ordering.